After two standalone adventures spotlighting supporting players in the DCAU, Justice League Unlimited’s second season dives headfirst into the overarching Cadmus storyline with an episode that clarifies why the secret government organization is so wary of the Earth’s superhuman protectors. While a good amount of new Leaguers appear to help with disaster relief in a city bordering an active volcano, the story is primarily focused on the original seven, with extra emphasis on Batman and Superman. 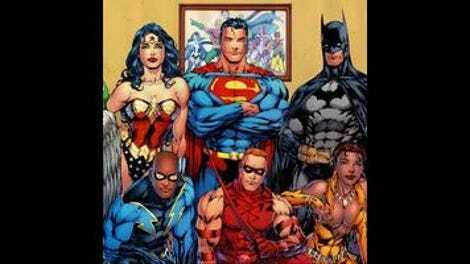 With the notable exception of The Question’s plot, most of the Cadmus arc will spotlight the original seven because those are the seven people that Cadmus is afraid of the most, and “The Doomsday Sanction” sees Batman and Superman facing off against major threats within the enemy agency: Amanda Waller and Doomsday. There’s an incredible amount of ground covered in this episode, beginning with a tense, exposition-filled confrontation between Amanda Waller and Batman. JLU is an exemplary superhero cartoon because it’s not afraid of complexity, and Amanda Waller represents the series’ metamorphosis into something more layered and mature. As the face of Cadmus, Waller reveals a new perspective on costumed vigilantes, one of paranoia and fear that these superpowered beings will turn on the people they protect. Waller’s views are the ones that led to the grim and gritty superhero storytelling of the Modern Age as comic-book writers explored the dark side of these characters, and Amanda Waller was a regular character in one of the landmark series of that era: John Ostrander, Kim Yale, and Luke McDonnell’s Suicide Squad. I’ll be talking about that series a lot for next week’s “Task Force X” review (in my opinion, one of the finest half-hours in the history of superhero cartoons), but what’s most important to know about Suicide Squad is that it managed to achieve that magical balance of maturity and fun, telling politically charged stories with a legitimate sense of risk that still had the excitement and humor of a Silver Age superhero comic. With no superpowers, a role in the political sector, and an appearance that distances her from traditional portrayals of women in superhero comics, Amanda Waller is the major source of Suicide Squad’s maturity, and that’s also the case in JLU. This series doesn’t spend much time looking at its characters’ domestic lives, so when “The Doomsday Sanction” opens with a quiet scene showing Amanda Waller’s morning routine, it feels like something big is about to go down. 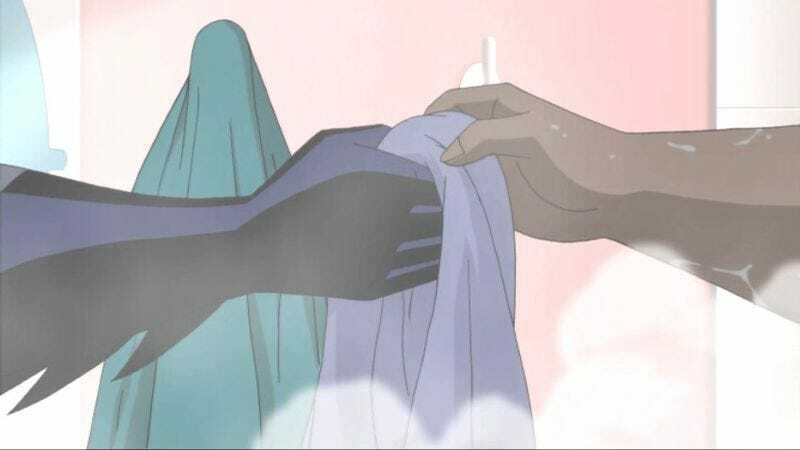 In an outstanding moment of silent storytelling, Amanda Waller reaches for a towel from inside her shower and Batman’s black glove appears in the frame to hand it to her, a simple visual that immediately turns the tension way, way up. "Get dressed. It's time we talked," Batman tells her. It’s a scary situation that is even more frightening because Batman isn’t in his usual shadowed environment, and the fact that he’s confronting Waller in such a tight, well lit space shows that he really means business. Amanda and Batman’s conversation is essentially an exposition info-dump, but it feels like a high-stakes standoff thanks to the script by Robert Goodman, who provides the story, and Dwayne McDuffie, who handles the teleplay. The two characters reveal what they know about each other to establish that they both have something to lose in this fight, and the voice actors fully understand the weight of their respective circumstances to deliver wonderfully deep performances. Kevin Conroy gets the opportunity to show so many different shades of Batman in this episode—he goes from threatening to worried to heroic to angry—and his experience with the role lends the story even more gravity as Batman goes into “save the world” mode and nearly loses his life in the process. In one of Andrea Romano’s most brilliant casting decisions, C.C.H. Pounder plays the quintessential Amanda Waller, depicting a fierce character that can hold her own against superheroes even though she’s shaking with fear on the inside. When Amanda tells Batman about how the Justice Lords sparked the creation of Cadmus, Pounder’s intense delivery reveals the woman’s passion to her cause, using the character’s worries as fuel for her fury. Waller needs to be as angry as possible here because she’s lying, and her rage covers up any tells so that Batman doesn’t realize she’s only sharing part of the Cadmus story. After Batman leaves, Amanda is able to let her guard down and her hand immediately starts shaking her American flag coffee mug, a small but immensely important moment that shows the vulnerability The Wall is hiding whenever she’s not alone. Before getting murdered by the gray monster called Doomsday, newly fired Cadmus scientist Dr. Milo tells the beast its history in hopes that it will go after his former employers Amanda Waller and Dr. Emil Hamilton. He explains that Doomsday was created from Superman’s DNA, most likely after the hero became a pawn of Apokolips at the end of Superman: The Animated Series, and when Doomsday became impossible to control, Cadmus shot him into space. Doomsday’s struggling managed to bring the rocket back to Earth, where he encountered the alternate dimension Superman that lobotomized him with heat vision, meaning Cadmus existed well before the arrival of the Justice Lords. The Cadmus arc aired during a particularly turbulent time in recent American history, one where the country was involved in multiple international conflicts that were largely preventative rather and than preemptive in nature. The September 11th attacks made this country feel vulnerable, so the George W. Bush administration went on the offensive and declared the “War On Terror,” a war against events that may happen at some point in the future, but also may not happen at all. The Iraq government didn’t have WMDs pointed at the U.S., in fact they didn’t have WMDs at all, but they could have had WMDs so the military was engaged. In the first two seasons of JLU, Cadmus plays the U.S. government while the Justice League assumes the role of potential terrorist organization, and rather than engaging with the superheroes diplomatically, Cadmus takes an aggressive approach that forces the League to become the threat Cadmus is afraid of. The Justice League may have a giant space gun pointed down at the Earth, but its biggest weapon of mass destruction is Superman, and so much of Cadmus’ energy goes into finding ways to take down the Boy Scout. Doomsday is the first wave of offense, and the majority of the action in this episode is a brutal brawl between Superman and Doomsday within the heart of a volcano, a sequence that takes advantage of the Kirby-influenced qualities in Dan Riba’s direction. As mentioned in last week’s review, Riba stages fight sequences that emphasize blunt, forceful impact rather than speed and complex movement, and that style works very well for Superman, who mostly just punches people really hard rather than engaging in the more complex fight choreography of someone like Batman or Black Canary. The big problem with Doomsday is that he isn’t an interesting character on his own; he’s a product of a ’90s event, and his sole purpose is to kill Superman without evoking any sort of empathy from the reader. Justice League and JLU solve this problem by making Doomsday a supporting villain that brings out the worst in the primary antagonists, whether it’s the Justice Lords or Cadmus. When General Eiling finds out that Doomsday has been unleashed on the disaster zone of San Baquero, he releases a Kryptonite-lined nuclear missile on the city, killing off three birds with one nukes as he eliminates Doomsday, Superman, and a major hub for drug trafficking. Because Amanda is the Cadmus voice of reason, she flips out when she finds out about Eiling’s actions, and the only person that can stop the nuke is the man who cornered Amanda in her shower earlier. In order to stop the missile, Batman flies a Javelin from orbit and manages to direct the weapon off-course using the aircraft’s magnetic charge, putting him in a situation that really should have been handled by someone with superpowers. He’s in the infirmary when the rest of the original seven (strangely minus Shayera) exile Doomsday to the Phantom Zone, and when he learns of his teammates’ actions, he begins to understand Amanda’s fears. In another moment of Bat-perfection from Conroy, a beat and broken Bruce snaps at Superman when he makes a joke about the piece of Kryptonite in Batman’s utility belt, and Conroy’s delivery encapsulates Bruce’s anger toward his teammates, his fear of what they could become, and his despair in discovering that there are legitimate grounds for Amanda’s paranoia. Bruce Timm has revealed that original plans for this season had Batman turning against the League and assembling his own squad of non-powered superheroes, and while that idea was unfortunately scrapped (seriously, how awesome would that have been? ), planting seeds of distrust within the League considerably complicates the team dynamic for the rest of the season. What are the chances that I’d be covering Hugo Strange’s final DCAU appearance a week after Bruce Timm returned to Batman with a DC Nation short pitting a Golden Age Dark Knight against Hugo Strange and one of his Frankenstein-like creations? Strange appears in “The Doomsday Sanction” in a non-speaking cameo at the Cadmus roundtable, an appearance that was initially supposed to lead in to a future Strange-centric episode that was shelved because of the notorious “Bat-embargo,” which kept the JLU writers from using most Batman characters. Timm’s new short, created as part of Warner Bros. ongoing celebration of Batman’s 75th anniversary, showcases the approach Timm would take if he was given the opportunity to create a new Batman series, one that would be fully set in 1939 rather than taking stylistic cues from the bygone era. It’s a gorgeous piece, and makes me ache for a new ongoing series done in Timm’s signature style. This episode features the first appearance of Tala, JLU’s resident purple-haired monkey lover. Love that moment when Dr. Milo imagines pulling out a gun and shooting everyone at the Cadmus roundtable. Such an efficient way of depicting his mental state in that moment. Other great guest voices in this episode: Armin Shimerman (Buffy’s despicable Principal Snyder) as Dr. Milo and J.K. Simmons reprising his role as General Eiling, the most trigger happy agent of Cadmus. Who’d have thought Doomsday would be this show’s way of incorporating some elements of A Clockwork Orange?